In 1843, novelist Victor Hugo's beloved nineteen-year-old daughter drowned. Ten years later, Hugo began participating in hundreds of seances to to reestablish contact with her. In the process, he claimed to have communed with the likes of Plato, Galileo, Shakespeare, Dante, Jesus--and even the Devil himself. Hugo's transcriptions of these conversations have all been published. Or so it was believed. Recovering from her own losses, mythologist Jac L'Etoile arrives on the Isle of Jersey--where Hugo conducted his seances--hoping to uncover a secret about the island's Celtic roots. But the man who's invited her there, a troubled soul named Theo Gaspard, has hopes she'll help him discover something quite different--Hugo's lost conversations with someone called the Shadow of the Sepulcher. I mean this as the highest compliment when I say that this book freaked me out. I don't normally read suspense and, without the historical aspect, I doubt I would have been interested in this book. However, the Hugo angle drew me in and I'm glad it did. I will say, however, that the book did not start out well for me. First of all, this book is the fifth in a series. While this book's plot is self-contained--meaning that you don't need to read the previous books in order to follow this plot--I felt that I couldn't quite get a grip on the characters of Jac and Malachi since I hadn't read in of the previous books. I can't fault Seduction for that, but I would put that out there for anyone interested in this book. Beyond that, I found the thought of Jac looking for Celtic ruins in Connecticut a bit far-fetched. However, once she arrived in Jersey, the book was on better ground. M.J. Rose could have muddled this story with unnecessary romantic plot twist, but I was glad to see that she avoided that. There are some strange plot twists, but these twists work out in the end. As for the characters, I really liked Jac and her damaged strength and the rest of the characters were all realistically drawn. However, Lucifer was probably the best written of the bunch. He's not your typical devil by any means. 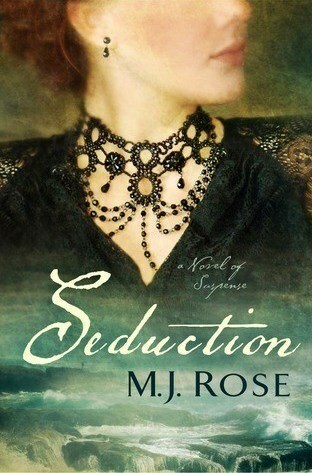 He's seductive and deceptive and, just like Victor Hugo, the reader will fall into his trap. What another opinion? Check out some of the other stops on the tour! You can see the full schedule here. This review is part of a book tour by Historical Fiction Virtual Book Tours. I received a copy of the book to read, but received no other compensation. The opinions expressed in this review are mine, and mine alone. It's creepy, but it I was able to read it at night without any ill effects! And, since I'm a wimp on such things, I' sure you'd be fine!